Starward Vacations has been operating as a store front travel agency since 1996. We actually sell all types of travel. Because of our love for the Caribbean vacation experience, we decided to specialize in the Sandals and Beaches resorts. Why Sandals and Beaches? Because we found that after many cruises, land vacations to such places as Paris and Hawaii that our trips to Sandals and Beaches resorts provided much more value than any other travel experience that we have had. What Starward Vacations brings to the table? First and foremost, Starward Vacations brings years of experience in all types of travel but especially to the Caribbean vacation experience. We visit a Sandals or Beaches property at least once each quarter both to experience the resorts and also to renew personal friendships with resort personnel from the General Managers down to the housekeeping staffs. All of those relationships are what make our clients’ experience that much better. The Sandals Guys at Starward Vacations are THE best choice for a Memphis area Sandals agency. We are a Sandals Preferred Agency and that alone get's our clients special attention when on property. It makes a huge difference. 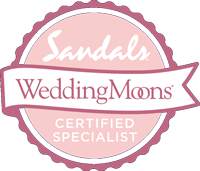 Our agents are all Certified Sandals Specialists and some are also Certified Sandals WeddingMoon Specialists. What this means for our clients is our agents are fully knowledgeable about the resorts themselves, all the processes required in booking a Sandals Caribbean vacation and also how to schedule and complete all the fine details of a Sandals or Beaches wedding or honeymoon. Starward Vacations is certified by IATAN (International Airlines Travel Agent Network) and CLIA (Cruise Line International Association). We are members of the Better Business Bureau and Vacation.com, the world’s largest travel consortium. We also have agents who have achieved the title of CTC (Certified Travel Counselor) which means they have achieved both high levels of knowledge and ethical standards. The most important thing to know up front is that Starward Vacations imposes no service charges at all. We work with Sandals and they provide our compensation. We work for the client’s best interest so our purpose is to not just fill a room but to place our clients in the right room at the right Sandals or Beaches resort. There are differences in each Sandals and Beaches resorts and we are fully aware through a thorough interview with our clients which resort is the perfect fit for them. We love repeat business from clients and we know that our knowledge and high service levels are what will get us that repeat business. There are over 200 different room categories spread across all the Sandals and Beaches Caribbean resorts. We can not only tell you the differences between all the categories but also we have probably seen in person all categories of rooms. The choice is yours to try to sort through it all yourself or let Starward Vacations guide you along when finalizing your Sandals or Beaches Caribbean vacation.